Gotta love this NPR headline, “The Mystery of Global Warming’s Missing Heat”. 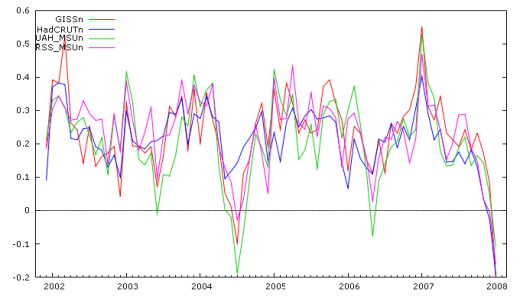 This is the most recent in a refreshing series of sober assessments that of course brief periods are not climatically meaningful, be they a month, a year, three years…or the past ten years without any warming. Imagine how surprised NASA’s PR shop is going to be. Things are wonderfully captured in this euphemistic kicker from the article: “it may be that we are in a period of less rapid warming.” Like, maybe, this? What’s global warming without the warming called? Come on, you can say it. Next post: What a Bright Idea!